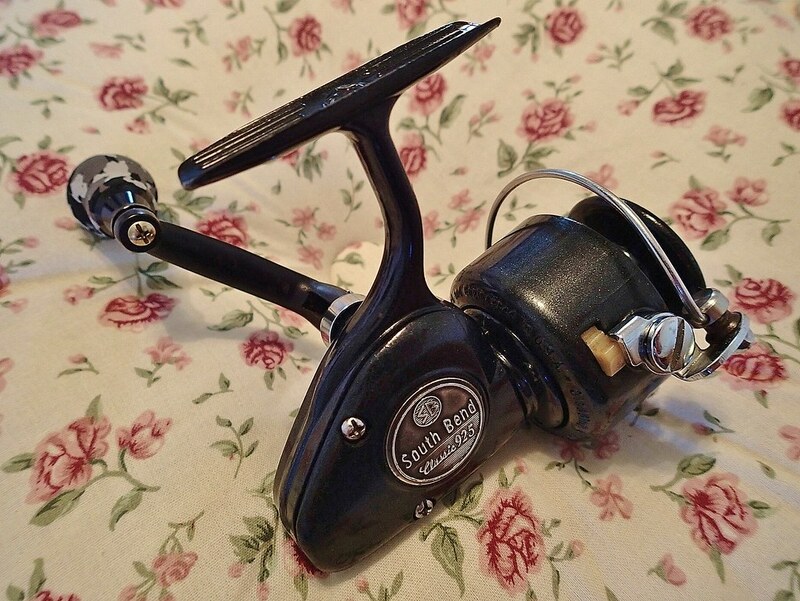 Chester recently posted a link to schematics of these 900 series reels. I was shocked to see the design of these reels. I never suspected a South Bend to be this solid. It also had a few unique features that caught my eye. I had one of these I had never opened...time to take a peek! Popping off the side plate presents a familiar sight. The cherished "worm drive" design! The parts look very Shakespeare. 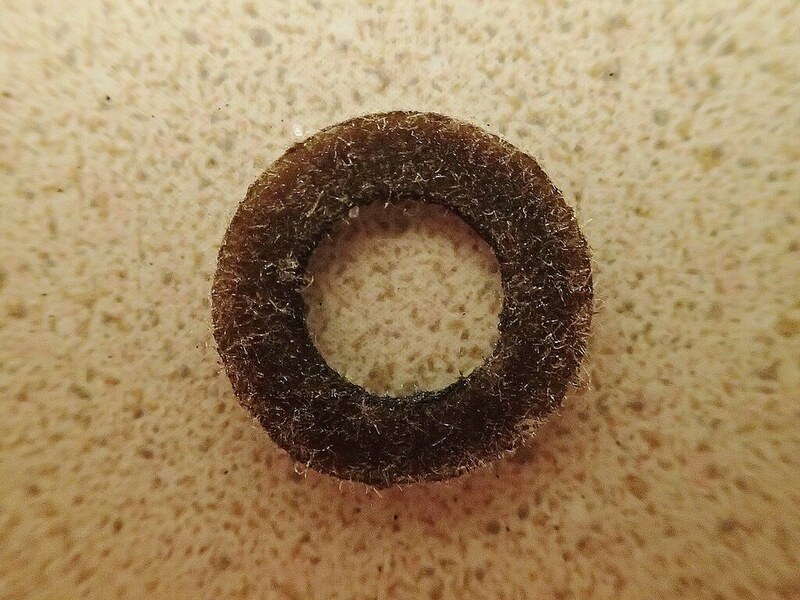 There was only one layer of grease, and that was a welcome sight, as the reel appears lightly used. The black arrow points to the level wind lever screw which is left hand thread. The anti-reverse design on this reel is too cool. At first it seems a bit over complicated, but it functions perfectly, and keeps stress off the gears' teeth. 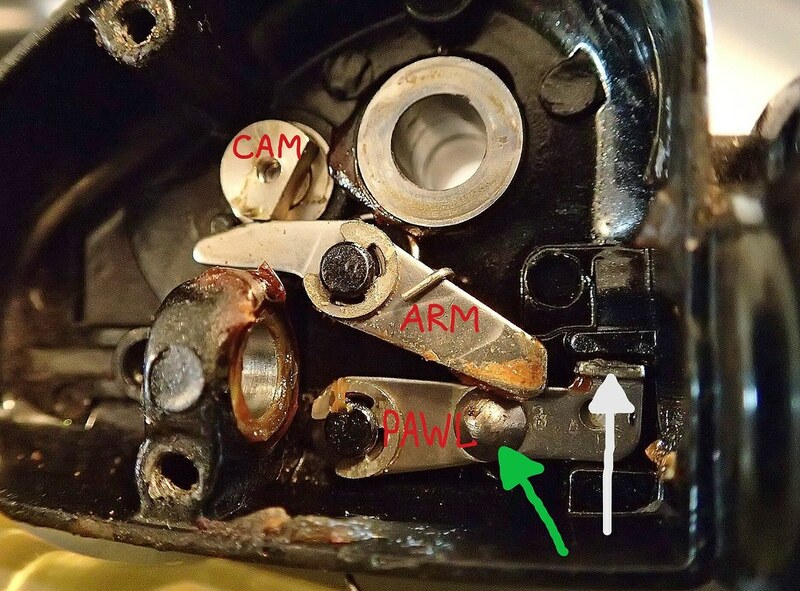 The cam lowers the arm, which presses the pawl away from the pinion disengaging the anti-reverse. The green arrow points to a cup with a spring behind it which keeps the AR engaged. The white arrow points to the lip which contacts the pinion. There is very little back play in the design. 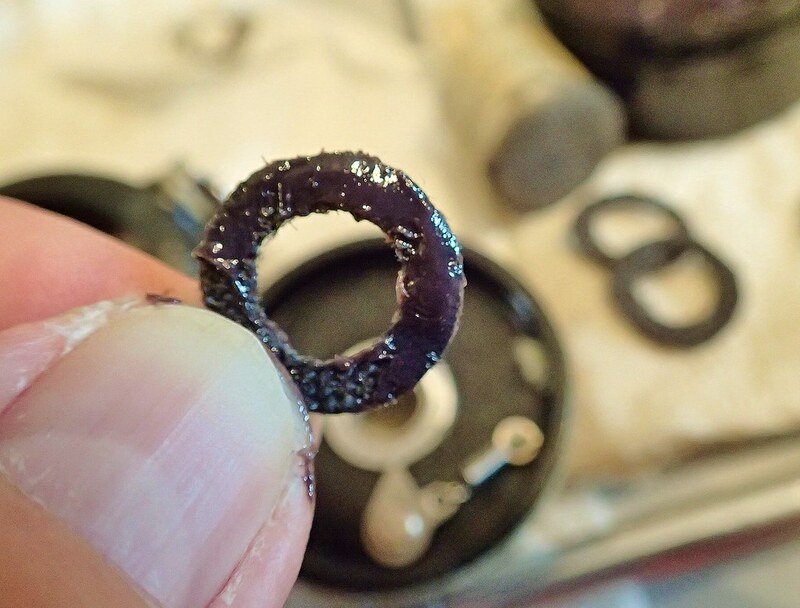 The drag is a classic 3-stack, but I wasn't excited to see the oiled felt washers. I haven't had great success with those felts, but I was determined to give them a fair shake. 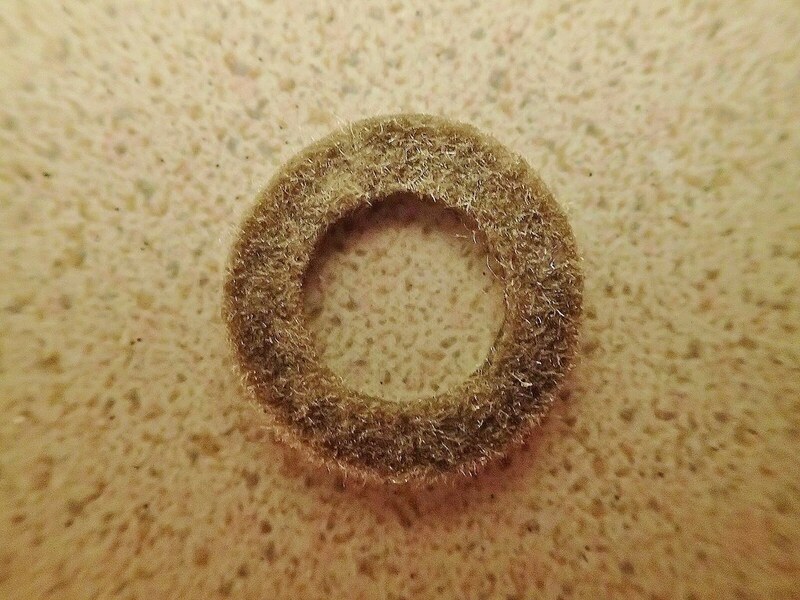 A closer look at the felt washer reveals a lot of dirt. I bet that felt holds sand and crud very well. Any chance of these being smooth would mean cleaning them. Cleaned, dried, and ready to oil again. The performance improved, but we still had issues. For some reason the drag was "pumping". As line was pulled off the spool, the pressure varied up and down...hmm... Also there was some pretty bad "chatter" at high settings. 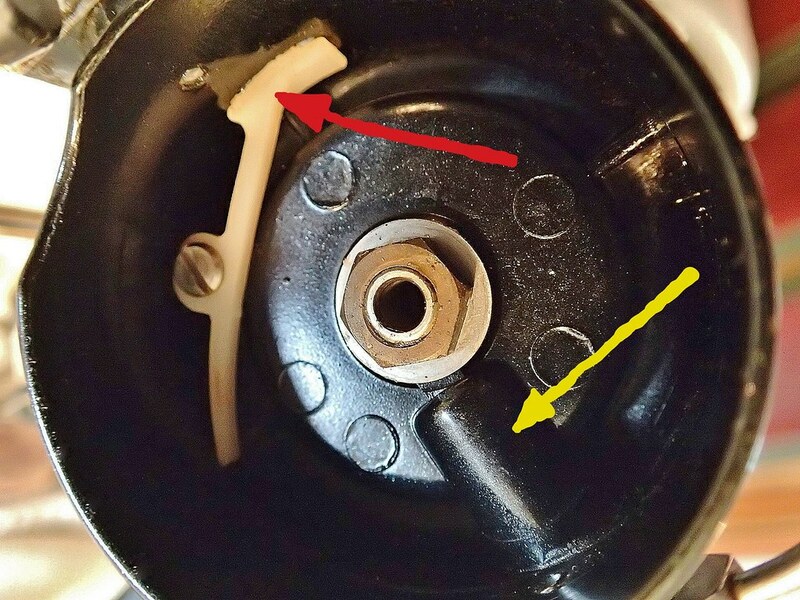 Looking everything over, I noticed where the spool rides on the under gear washer there was paint over spray on half the surface, just like the area the blue arrow identifies on the rotor. The orange arrow shows the bottom of the spool polished smooth, thanks to my trusty wine cork/sandpaper tool. No more pumping! Either the paint was slicker than the bare surface or vise versa. Unfortunately, the chatter at high settings remained, which would limit smooth drag to lower settings only. Although this would be fine for most ultralight uses, it's no good for me. I plan to push this one beyond original intentions...I wanna work this dog! 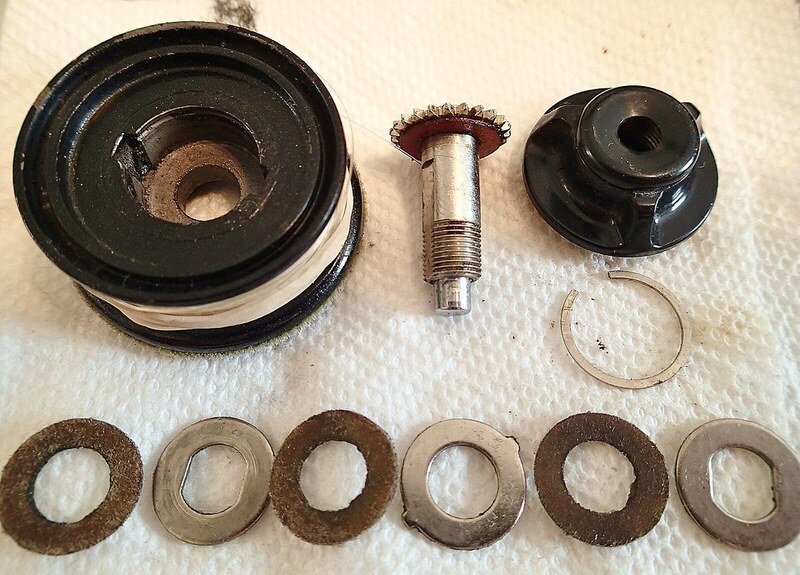 The photo below shows the inside of the rotor, which South Bend calls the "pickup housing". They tout it as being sealed to keep bearings dry. I'm not sure how that works out, but there are a few cool features in there. The yellow arrow points to the area that houses the bail release plunger, which appears to be sealed on the outside. The red arrow identifies the bail stop, which will bend down and allow the bail spring to decompress. Also...there are no balance weights...South Bend says it is dynamically balanced. Here's a different view of that bail release plunger indicated by the purple arrow. 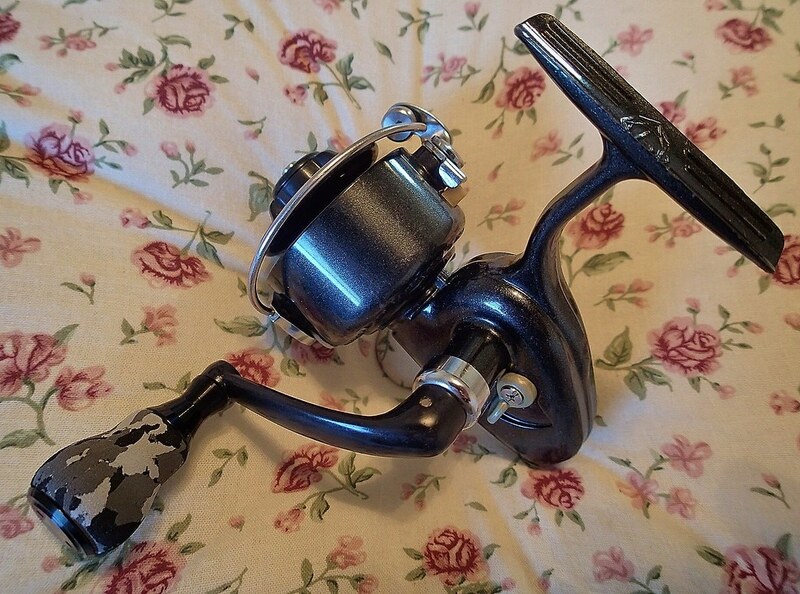 I really like the bail system on this reel, it seems rock solid. I pictured these parts with tools for a reason...just look at 'em...they are tool quality pieces. No pot metal, no aluminum, no alloys, not even any brass! Every piece in this thing is steel. It looks like stainless...made yesterday...not near 50 years ago! I greased the gears with Superlube and used CorrosionX HD in the bearing. Note that little bit of Penn blue grease around the level wind lever. That was just to cause confusion. 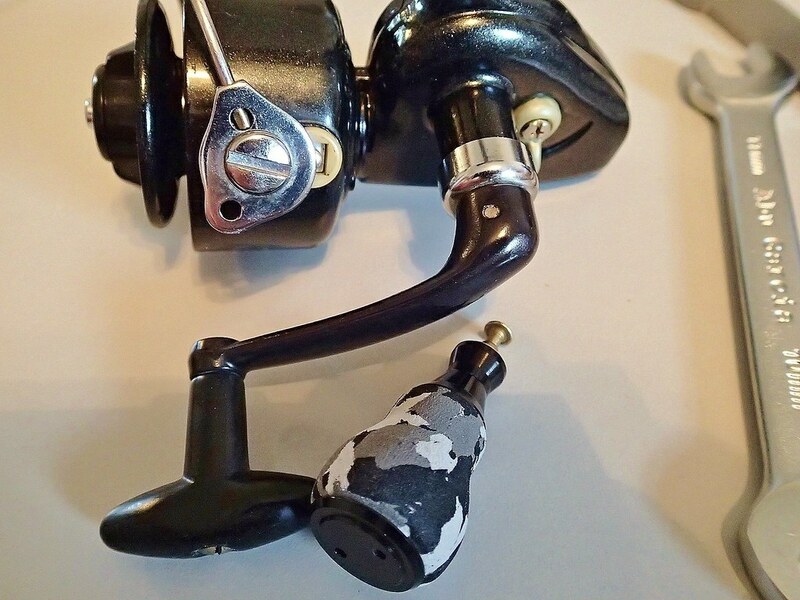 Although I really like the torpedo style handle knobs, I think this aftermarket knob will look killer on this reel. Glad to see this thread pop up, Mo65, I just got back from the mailbox and have unpacked a South Bend Classic 960, which is the big boy of the classic series. Your's looks more mint than mine. Got a question. 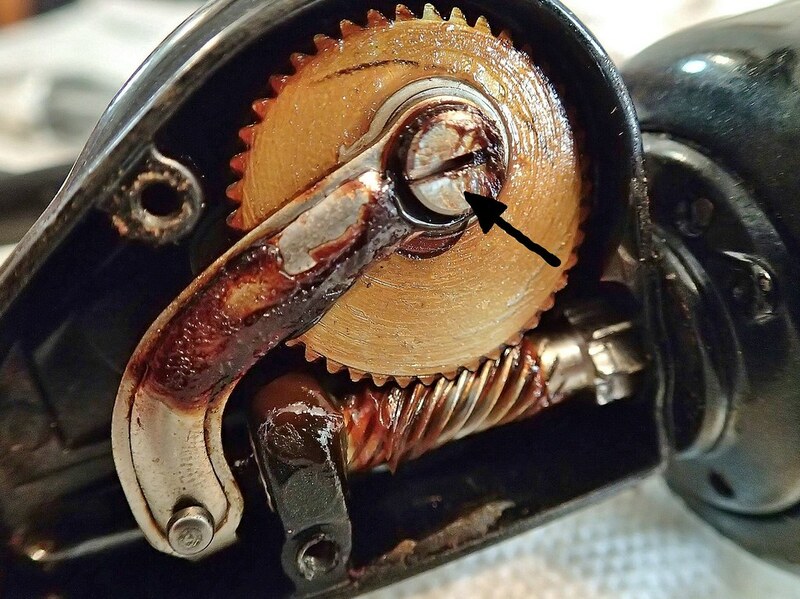 When you removed the drive gear, pinion gear, and oscillating lever, did the anti-reverse assembly stay intact with no springs flying to infinity? 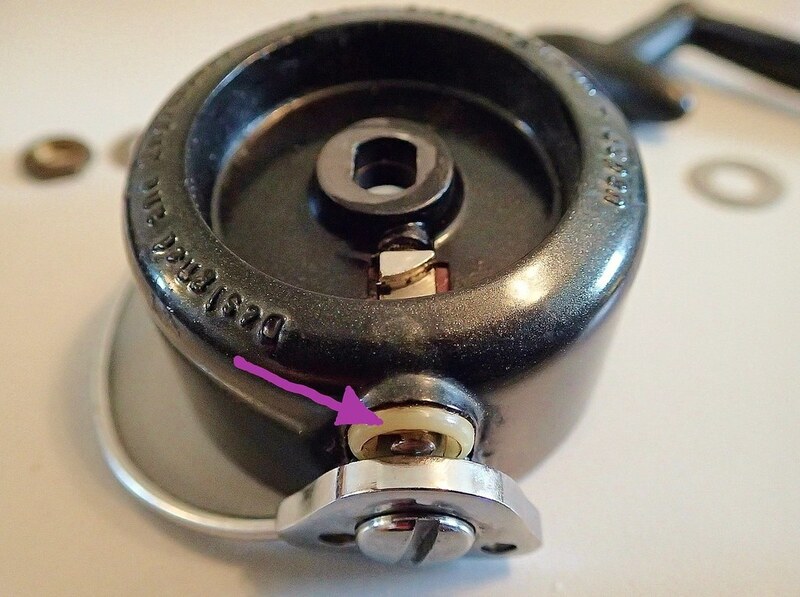 Looks like everything is either secured by screws or c-clips. I don't know how you get your pictures so clear. Do you use photo editing software? I use an old Nikon D80 that's probably 12 years old. Sometimes I use a free photo editing program (Photo Pad Image Editor) that's very limited. Whenever I get around to servicing this one, I'll start a new thread, perhaps the moderators can begin a South Bend section because there are more models out there worth a look. Lots of anglers used various South Bends in my neck-of-the-woods growing up in the 1960s. Again, thanks for posting these pics, it'll make it easier for me. 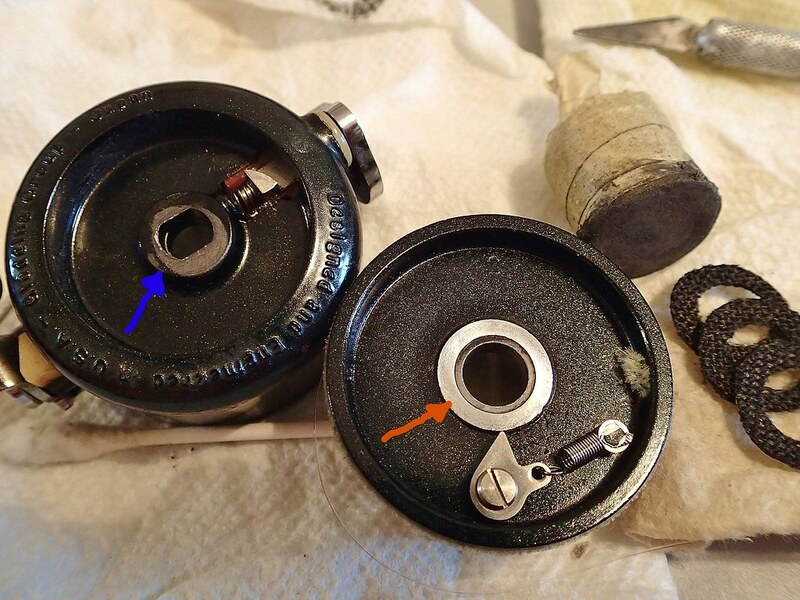 When you removed the drive gear, pinion gear, and oscillating lever, did the anti-reverse assembly stay intact with no springs flying to infinity? Looks like everything is either secured by screws or c-clips. Yes, the AR assembly stays intact unless you pull the c-clips. If you look close...you'll see the design on mine is a bit different than the schematic. I don't know how you get your pictures so clear. Do you use photo editing software? I use an Olympus TG-2. Pro photographers hate digital cameras...they allow a hack like me to get professional results. Well done, Mike! Nice explanation! Nice reel. Nice pointy arrows. Nice photos. I think your secret is the lighting. 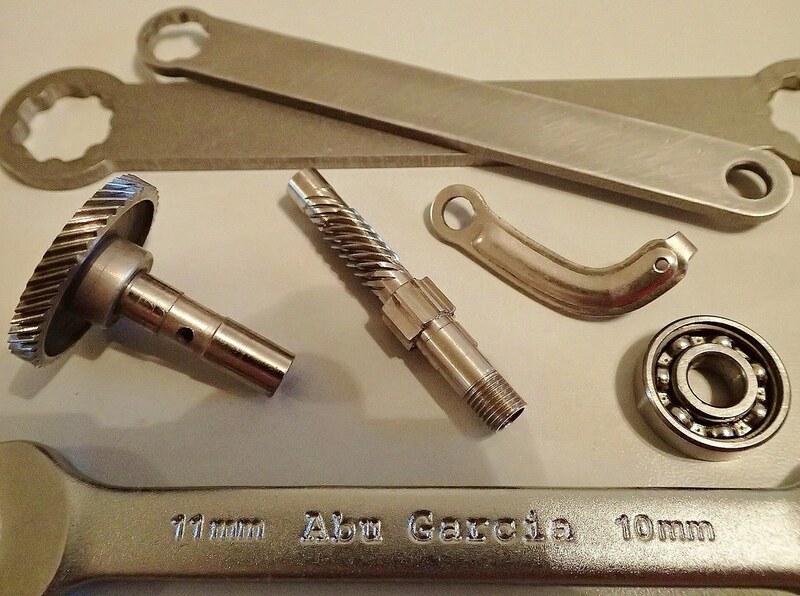 Nice ABU wrench too. Good resource for future excursions into SB land. I've been watching for another of these jewels but haven't seen any for sale. Who's holding all 925s? There is an ultralight SB Classic 360 on ebay, but very doubtful it's as good as the 925. 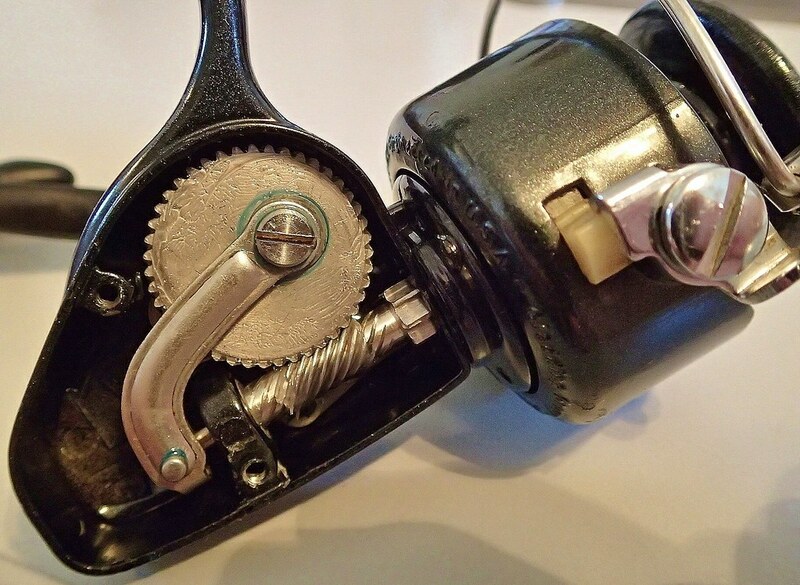 It doesn't have the worm gear setup, just a simple sliding oscillator that rides on a stud on the main gear. Bet it's cheaper metal inside too. $29.95 shipped. At most I might give them $15-$18 shipped.